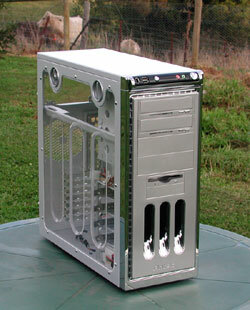 Antec have really made a name for themselves, in the Australian market at least, over the last couple of years. 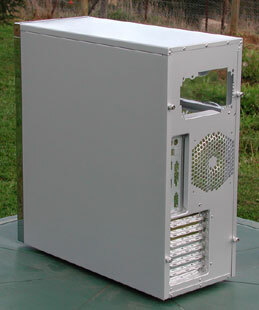 Their build quality has been well-regarded for a long time, but the last few generations of cases from them are edging closer and closer to that lofty ground inhabited primarily by Lian-Li. The luxury aluminium case market continues to grow, as more and more enthusiasts decide it's worthwhile spending a few more dollars for a case with classier looks and better features. The latest offering from Antec is their P160 "Super Mid Tower", which certainly makes an effort to catch the eye. Antec's distributor in Australia, Altech Computers, sent one over for us to look at. Catching the eye on the front are the deep, chromed front vents and the movable top panel. This rotating panel does not fully hide the connectors, but can be adjusted to point them upwards at about 45 degrees, presumably for when the case is under your desk, or forwards, for when it's on top of your desk, or any angle between. 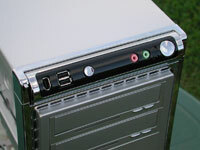 Firewire, USB and audio connectors are found here, as well as the power and reset buttons. There's a button to lock it into either extreme position. 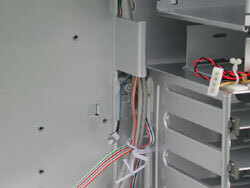 The cables leading out of the back of this panel do restrict the movement to some extent, but it's a lot more accessible than most front connector panels. At the back there's a 120mm fan mount, with the honeycomb mesh raised away from the fan blades to help reduce noise. Removing the motherboard-side panel is a little tricky when you first approach it. It's obvious that the two thumbscrews on the back of the case should be removed, but the panel stays firmly in place. Only when you have removed the front of the case are another two thumbscrews revealed. If you're like me and expect to have to remove both side panels to get the case front off, you end up in a frustrating little conundrum for a while. 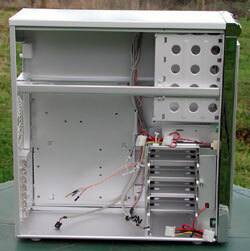 Of course, given that this case has a removable motherboard tray and uses drive rails, most people will never remove the motherboard-side panel. Antec continue their trend of mounting hard drives sideways across the case - I note that other manufacturers are doing that now too. 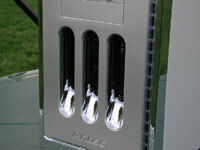 The side panel is secured by two large twist-latches, one of which can be locked with the usual round key. Once you turn the latches, you pull the top of the panel straight towards you, then up and off. This again is different to how most people will be used to so it's tricky at first, but no problem once you figure it out. 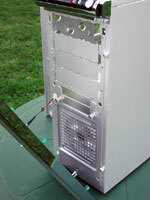 The removable motherboard tray is secured with a single thumbscrew. Unusually, the tray lifts out of the side of the case, instead of sliding out of the back as per Lian-Li's PC-6077 and many other cases. I assume this is because of the 120mm rear fan mount, which would make it impossible to slide the motherboard out with any decent-sized CPU cooler attached. 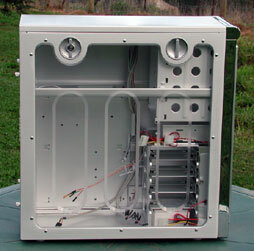 Removable motherboard trays are great for partially assembling and testing your system with more room to move than inside the case. In the box you also get a well-written manual, a bag of drive rails, a large collection of screws/standoffs and the keys for the side panel. You also get a 120mm fan in a kit with its own instructions and mounting screws. This is obviously meant for the 120mm exhaust panel on the back of the case and indeed was twist-tied in place at that location when the case arrived. 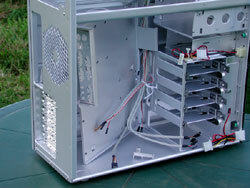 No power supply is included, but Altech provided Antec's grand-daddy of PSU's, the TruePower 550W. We'll look at that in more detail in an up-coming PSU mini-roundup, but if you're looking for a monster PSU it should be on your short list - we've been using them in review testbeds for a long time now. As well as the 120mm rear-mounted exhaust fan, this case has a 120mm intake fan tucked away behind a thumbscrew panel in front of the hard drive bays. 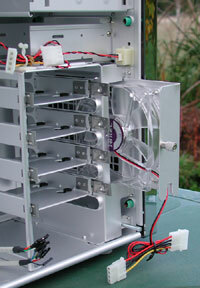 The bays are spaced a little to allow airflow around the drives. The lack of a PCB band around the body of this fan indicates that it isn't an LED fan, whereas the rear-mounted one does glow. Of course, you could swap them - but as we'll reveal later you probably don't need to bother. 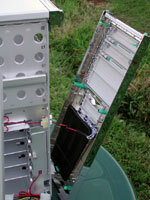 The odd green connectors in that picture are how the front panel of the case is secured. You simply pull it off - a little force is required the first few times. That green colour appears elsewhere on the front of the case - it seems to be the actual base colour of the plastic from which the front panel is constructed. It's then been coated in the shiny covering. The front panel, and particularly the rotating connector panel at the top, do have a plasticky feel to them once you get up close. They are solid enough, though, so they don't make it seem cheap and nasty. Once you have the front off, this unusual device is revealed. Curiously, the manual makes no mention of it - but a quick investigation reveals its purpose. 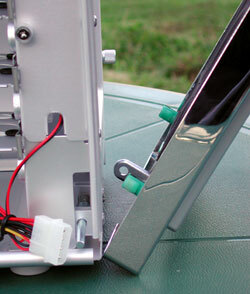 When the side panel is on, that pin is moved forward and threads through the tab connected to the front panel. This prevents the front from being pulled off when the side panel is installed. Otherwise, even if you had the side panel all locked up, someone at a LAN could simply pull the front off, slide your DVD drive out on the drive rails and walk off with it, for example. The front panel is connected via a couple of wires, but Antec have quite cleverly used a 3-pin fan connector to make it easy to unplug the front panel and remove it. Those wires power three LEDs that point downwards in the three intake channels on the lower front of the case. This is why you probably don't need a glowing fan in the front of the case. The black air filter is removable and washable.